I've been going through my blog and updating some stuff (see: my entire sidebar!) and I realized that I have never actually posted my diagnosis story. That's pretty weird for a blog all about diabetes, right? Because I've come to this realization, I'm finally going to tell you guys about my diagnosis. Before I start this, I should warn you that I don't have too many memories of being diagnosed, since I was diagnosed when I was 5 1/2 years old and it's been 10 1/2 years since then. Well then, let's get into it. From what my mom tells me, my kindergarten teacher first noticed the symptoms. (Random blurb: what I remember the most about my teacher is her telling me one day while I was working on something that I said I, "can't do," that the word 'can't' was not allowed in her classroom. She told me to say that what I was doing was challenging, but could be done. This little blurb of a memory has stuck with me since then. I digress.) My teacher noticed that I was going to the bathroom. A lot. I would raise my hand while she was reading and have to go, I would go to the bathroom, then five minutes later I would raise my hand and ask to go to the bathroom again. After she noticed this, she called my mom and told her what was happening. My mom has told me that she never really noticed any symptoms and that she just thought I was drinking a lot of water because I was growing. (Or something along the lines of that.) Thinking I had an UTI, my mom called the pediatrician and made an appointment. The doctor ran a few tests then walked into our room. He told my mom that I had diabetes; I cried and hugged my stuffed bear, Maggie while I was sitting in my mom's lap once we heard the news. I'm pretty sure I had no idea what diabetes was at that point: I just knew it was bad. We were told that we had to go to the hospital. At the time that hospital was known as Scottish Rite, but now it is better known as Children's Healthcare of Atlanta. At the hospital, I got one of the 'old-school' fancy Rufus the bears. 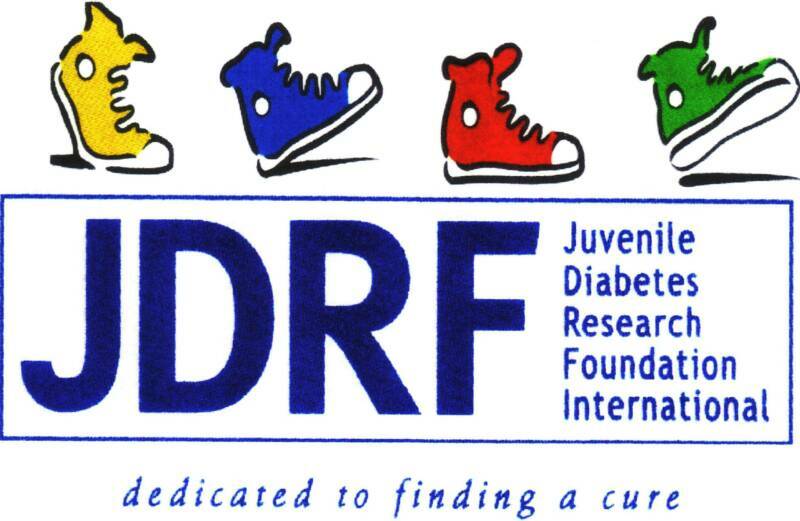 She had one of those white bear-sized JDRF shirts on over her dress. I remember laying in my hospital bed and watching George of the Jungle one night and Anne of Green Gables the next day. The most vivid memory I have from my stay at the hospital was of the first time I had to get a shot. The syringe was just one of your typical BD 30 unit syringes; I refused to let the doctor give me that first shot, demanding that my mother give me my very first shot. She pinched some skin on my arm and the needle went into my skin. It hurt. A blood tester was lying on the table in the corner of my room. This first blood tester in the saga of its many successors was the OneTouch Ultra Smart. This is metaphorical or something, right? I was put on a pump about a year and a half later. Being on trial for the Animas IR 1200 was the coolest thing ever, and I walked up the driveway after I got home excitedly showing everyone my cool new 'toy.' (When I switched from my IR 1200 to my Ping, I was very traumatized and disturbed that Animas had replaced the arrow button with a button with 'OK' on it. Needless to say, I don't do change well.) For many years my parents had to put in my pump sites for me, since I used the Comfort infusion sites. (AKA the weirdly angled sites without inserters.) During my first year at camp, I put in my site for the first time. All I did once I got back was brag and brag and brag to my parents; however, I still refused to do put my sites in myself. It was still a scary thing to do! While I was at camp another year, I discovered that there were Inset 30's that had inserters: I could finally put my own site in! This was pretty amazing for me; I was really excited when I got to try one out at camp. After getting back from camp, I asked my parents about using those instead. I used those for a while, until I found out about the regular Insets. (Also at camp; surprise!) We asked the doctor if I had enough fat to use those, (that's probably the only time you'll ever see someone being happy for having fat) and I did. Happily, I used those instead. The first time I put an Inset in was in Jamaica. Putting in a blue site, but then using a pink pump site clip when I went swimming was pretty much the coolest thing ever. In middle school, I decided I wanted to try going off of the pump. (Probably because I felt like the odd one out.) What I told my parents was that my pump was getting in the way of exercising during gym. (This was true. It would bounce up and down while I was jumping and hit me because I was still using a Pump Pak. This one, to be exact. I used a Pump Pak because when I was in first grade I tried to clip my pump to my pink sweatpants, but they kept falling down. Now I can wear pump clips without any worries of that happening, thankfully.) We went to the doctor and I was trained on how to use insulin pens. The first time that I wanted to switch back to my pump, it was right before seventh grade. That did not work very well. (Random seventh grade memory: this girl that I thought was really cool told me that testing my blood was gross in the locker room and then I proceeded to dislike her a lot, and I got mad at my best friend at the time for being friends with her. Sorry for the sidetracking again.) Soon after, I went back to pens, since we didn't have enough sites. I switched back to my pump permanently before 8th grade since I felt left out at camp, being the only one on a pen, and I've been on a pump since then. And that's where this version of my blog begins, and my life is chronicled in much more detail, at least diabetes-wise, here. You guys know all about me waiting forever to get my CGM. (And CGM sites.) You guys also know all about Camp Kudzu and the weird stuff that happens at school. This probably sounds super weird, but I never knew how amazing it would be to share all of my ups and downs with diabetes with (former) complete strangers on the internet. You are the best.